« Ice Cream Cones flavored Kool-Aid!! FINALLY, after several weeks of a movie theater-less existence, Steph and I went to our local AMC last night. 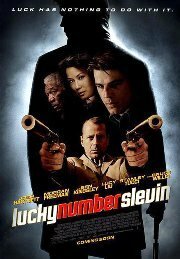 Still not much out that excites me, but Lucky Number Slevin looked pretty good. It looked like a clever, funny crime movie and it had plenty of good actors in it, so we took a chance. First of all, lots of people die in this movie. In the first 15 minutes we were up to like 10 individual deaths you actually witness. Took me by surprise. But then you settle in for the quick and clever dialogue and the movie becomes fun. The movie is written well, and the dialogue is funny, but for a while it gets confusing. I was struggling to keep up with the fast pace halfway through, but then I caught up and it flowed perfectly right through to the end. All the characters are fun and interesting, and there are a lot of them. Let me say first, that I am NOT a fan of Josh Hartnett. I can’t even think of a movie I liked him in. I liked the movie Sin City, but he was dead in the first 5 minutes of that movie. I hated him in The Faculty, Halloween H20, 40 Days 40 Nights, Pearl Harbor, Virgin Suicides……you get the idea. In all of these movies he acts like a wooden chair. He doesn’t show any emotion like his face is full of novacaine. He changed my mind in this movie. He showed emotion and was a generally likeable character throughout the movie. If he continues performing like this from here on out, I’ll start liking him. As for the other actors, they were a joy. I used to not like Morgan Freeman. I know, I know, I’m in the minority, but it seemed to me he played the same riff on the same character forever. I have since changed my mind. His latest string of movies including Sum of all Fears, Bruce Almighty, Unleashed, Batman Begins and Million Dollar Baby have absolutely brought me into the “loving Morgan Freeman” crowd. Freeman delivers in this as well. He plays “The Boss”, the arch-rival of Ben Kingsley’s character. He plays it menacing and cool, but you still like him. Bruce Willis continues being a pretty cool customer. He plays cold-as-ice assassin Mr. Goodkat, which, truthfully, is a variation on his characters Jimmy “The Tulip” from Whole Nine Yards and Jackal from The Jackal. Despite the character being a slight retread for Willis, I still very much enjoyed him in this. Another very good actor and a surprise in this movie was Lucy Liu. I really like her. She’s had only a few roles but they’ve been good. I forget just how gorgeous she is. I look forward to her future roles. This brings me to Sir Ben Kingsley. What the hell has happened to this guy? He used to be a phenomenal actor; Ghandi, Schindler’s List and Searching for Bobby Fisher. His latest run of movies is mind-boggingly bad; Thunderbirds, Suspect Zero and A Sound of Thunder?! Is he slumming? I don’t get it. Well, in Slevin, for me, he’s the weak link. Going for the Kevin Spacey/Lex Luthor look of shaved head and goatee, he portrays The Rabbi. A little cheesy and over the top, he really doesn’t have that much to do and seems to try to over-compensate. In his scenes he looks like a dying fish. His eyes are wide open and his mouth is moving. I don’t think he ever blinked. Weird. Sir Ben’s fishy acting aside, it’s a small issue I have, the movie is, top to bottom, really very good. All the characters are fun and the dialogue is crisp. You get a lot of Tarantino-like camera pans and dissolves; things jump back and forth in time, but it’s fairly easy to keep up and the ending took me by surprise. I would recommend it. If you enjoyed Pulp Fiction or Usual Suspects, you’ll probably enjoy this movie. I saw another crime based movie recently. Knowing my predilection for heist movies, you’d be surprised to know that I never saw Dog Day Afternoon with Al Pacino. I rectified that situation last week. The movie is based on a true story about two guys who try to rob a bank in Brooklyn. The two robbers are portrayed by Michael and Fredo Corleone; Al Pacino and John Cazale. Dog Day was filmed a year after Godfather Part II, which surprised me because I thought it was filmed before. The two try to rob the bank and everything goes wrong. Pretty soon they are holed up in the bank with a dozen or so hostages surrounded by the police. It’s a gritty and intense drama with really good acting by Al Pacino, Charles Durning and Chris Sarandon as Al Pacino’s male lover (yes, you read that right). It was a good movie, and I see why it’s a classic, but I don’t think I’ll be revisiting it anytime soon as it’s somewhat of a downer. Check it out if you enjoy watching classic cinema, but be prepared for it’s dark and gritty storyline. This entry was posted on April 13, 2006 at 8:53 pm and is filed under movies, reviews with tags movie reviews, movies. You can follow any responses to this entry through the RSS 2.0 feed. You can leave a response, or trackback from your own site.